It’s not often that I cycle across an international border but in this week’s video I do it 9 times! That is because I cycled on the former railway line between Tilburg and Turnhout, which goes through the Belgian enclaves of Baarle. I had used this railway line before, but that time I was in one of the last trains! In this week’s post the story of the “Bels Lijntje”; the “Belgian line” turned into a cycle route. Signage at the beginning of the line in Tilburg. The international border at the edge of one of the many enclaves in Baarle. This man will leave the Netherlands in an instant. In 1855 the first railway connection between Belgium and the Netherlands was opened between Rotterdam and Antwerp. A shorter route to Brussels (and further to Paris) would be possible though, from Amsterdam and Utrecht via Tilburg and Turnhout. At the request of Amsterdam, Utrecht and ʼs-Hertogenbosch, the border crossing railway line between Tilburg and Turnhout was built. The first train used the line on 1 October 1867. The huge international station directly on the border (the border cut through the platform) was built in the first years of the 20th century. The line never became a main route for international travel though. The same location as the previous picture. Only the platform walls remained. The steel structures were placed here in 2017 to commemorate the 150 year anniversary of the line. They are a reminder of the big international station that was here. The double white lines indicate the international border between Belgium (left) and the Netherlands (right). There are hints everywhere that there used to be a railway line in the forest. The line did not become the success it was hoped it would be. Although this was the shortest route from Amsterdam to Paris, the many railway companies didn’t cooperate well. 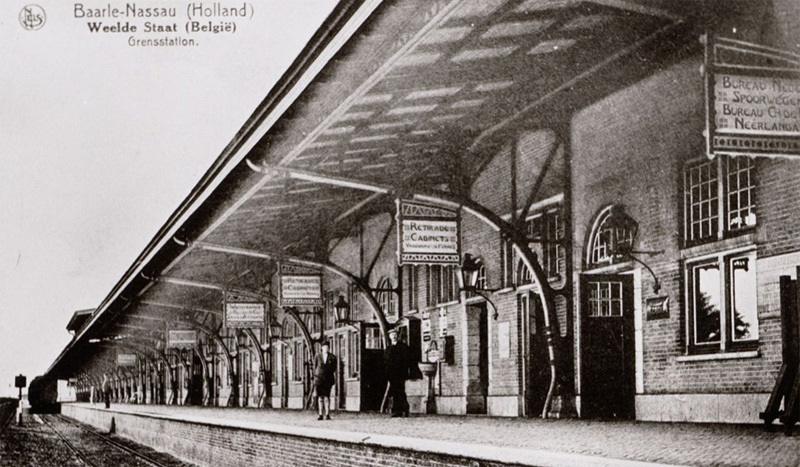 It meant the connections were so bad that travellers even had to spend a night in Turnhout to catch the train to Paris the following day. In the beginning of the 20th century things started to look up when the railways were nationalised and stations were expanded, especially the border station was reconstructed in a grand manner. But then came World War I and that was devastating for this line. It struggled on, but in 1934 passenger trains stopped using it. Goods were transported until the early 1970s, when road transport finally proved to be more competitive in this region. On 1 June 1973 the last goods train used this line. Less than a year later the tourist board in Tilburg initiated the foundation of a steam train company. 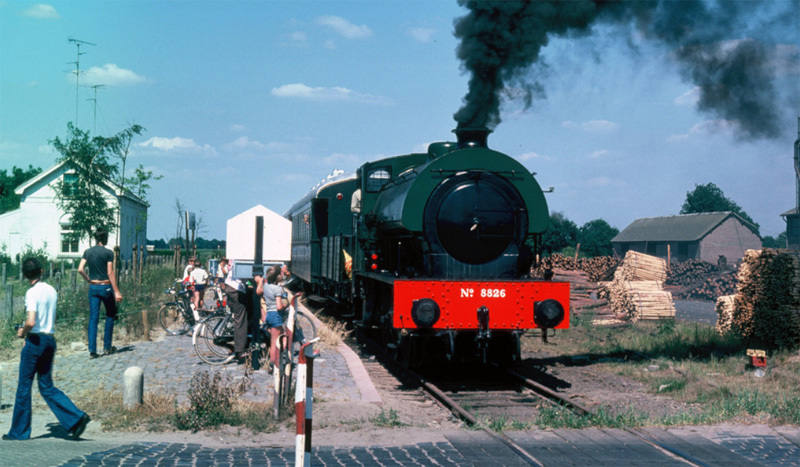 With the help of the Dutch National Railways, which at the time were looking for a line to exploit their old steam trains, the Foundation Steam Train Company Tilburg Turnhout(Stichting Stoomtreinmaatschappij Tilburg Turnhout; SSTT) was established. 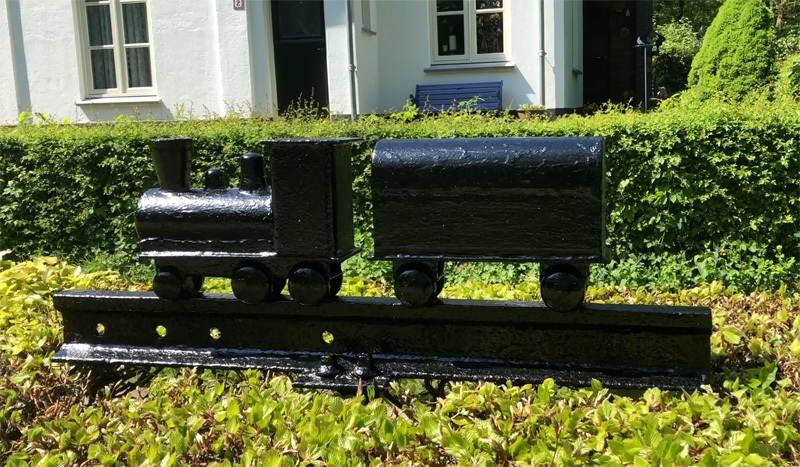 This foundation hired the equipment from the Dutch Railways and started a volunteer run passenger steam train service in the summer of 1974. It was disappointing for the foundation that the Belgian Railways did not want to cooperate. They did not want a bridge to be operated by volunteers. That meant the steam train had to stay in the Netherlands. Since there was not much to do for tourists at the exact border, a forest restaurant, just south of Baarle, got an improvised station, so people could have a refreshment at the end of the journey. It was this steam train that I was in as a teenager in the summer of 1980. I even kept the train ticket! The Alphen station in the late 1970s with the museum steam train. 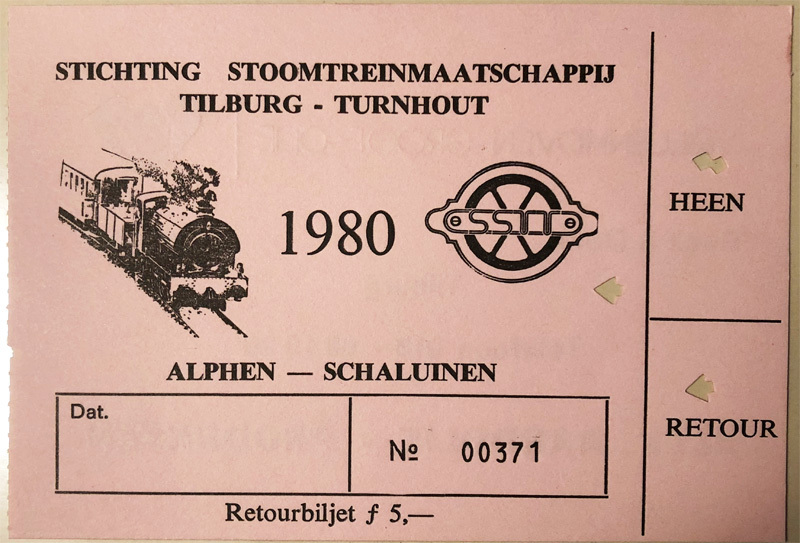 My train ticket for a ride in the summer of 1980 from Alphen to the temporary station in Schaluinen, a restaurant south of Baarle. This circa 8km trip cost 5 guilders at the time. Today’s equivalent would be €4.87. But the interest in the service subsided. The 1981 time-table mentions only 3 train rides for that year and the well over 100-year-old line was now in a state of disrepair. Due to a lack of proper maintenance the condition of the tracks was so poor that the permit to use the line was revoked for safety reasons in 1982. Then in 1983 the National Railways were no longer allowed to support touristic activities due to cuts in their budget by the government. That meant the end of the steam train company, as there was no way the track repair and maintenance could ever be financed. The foundation was terminated in 1984, the trains went to the Railway Museum in Utrecht and soon after the tracks were dismantled. In 1989 the old railway was converted into a 33-kilometre-long cycleway. Even before it was officially opened, in 1990, people were using it in high numbers. In 1993 the last part, from Baarle to the border, was finished. The route is entirely on the former railway except in Alphen, where some industrial buildings had already been constructed on the old railway track. 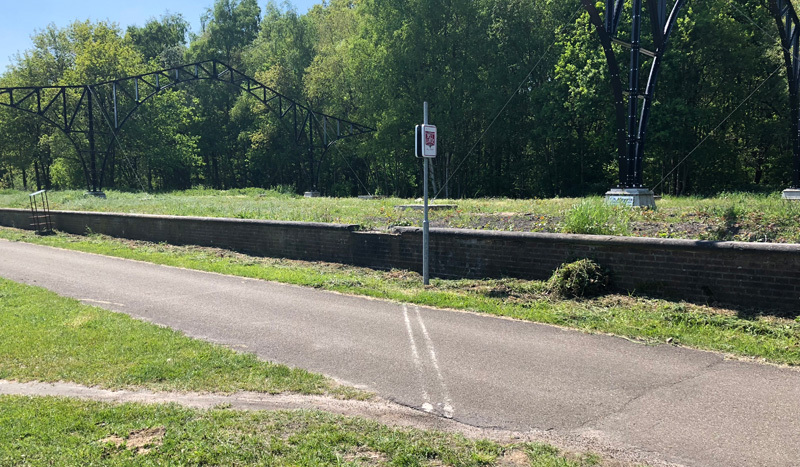 In 2017, on the occasion of the 150-year anniversary of the line, some of the cycleway had been upgraded, with a new surface on a widened path, and there were a number of new initiatives to give the line a boost. The municipalities on both sides of the border now cooperate to stimulate tourism and nature development. There is a bee project, works of art were added, a watch tower was built in Belgium and all the signs and the maps were updated. 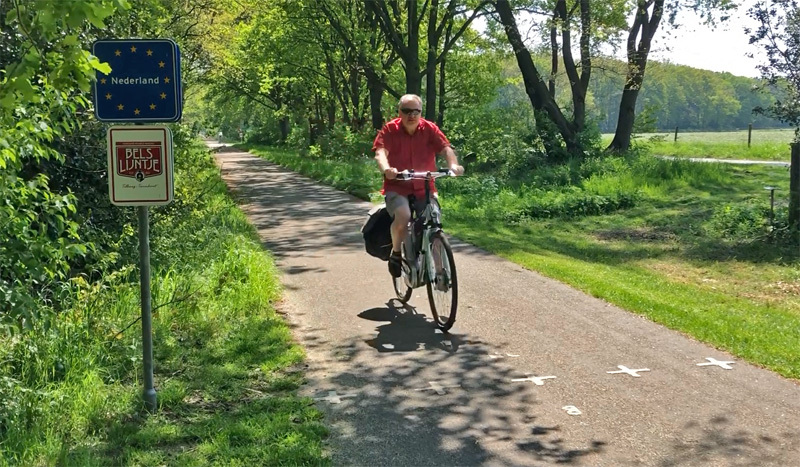 In Tilburg you can now cycle both on the original route through the city and the 1958 detour west of it, that I filmed in my ride. I took the train for the 25km distance from ʼs-Hertogenbosch to Tilburg. Unfortunately that is restricted in the evening rush hour so I needed to be back at 4pm, which meant I couldn’t cycle all the way to Turnhout. The cycleway at one of the enclave’s border markings. The ride was mostly like this. Sometimes there was a wider part and sometimes also in red asphalt. Most of the time the route was very similar to this. Most striking in the route is the village of Baarle, which is one village with two names in two countries. Not on either side of a border but in the form of numerous enclaves and exclaves. At the village entrance there is one sign with both names: Baarle-Nassau (NL) and Baarle-Hertog (B). The village has two town halls and Belgian and Dutch schools, churches and other services. This strange division dates to the 12th century when parts of the village belonged to the Nassau family in Breda, that ultimately became Dutch and other parts to the Dukes of Brabant (Hertog means Duke) that are now Belgian. Currently there are 22 Belgian enclaves in the Netherlands, that in turn have 7 Dutch exclaves within them. Although the Netherlands and Belgium already separated in 1830 (which meant they were only united for 15 years), the borders were only determined in an 1843 treaty. However, in this village the situation was so complex that it took until 31 October 1995 before the borders of Baarle were finalised. Not that anyone wanted land swaps to end the situation, on the contrary, the borders are thought to be an integral part of Belgian/Dutch history. They are now a tourist attraction and all the borders are marked on the ground. 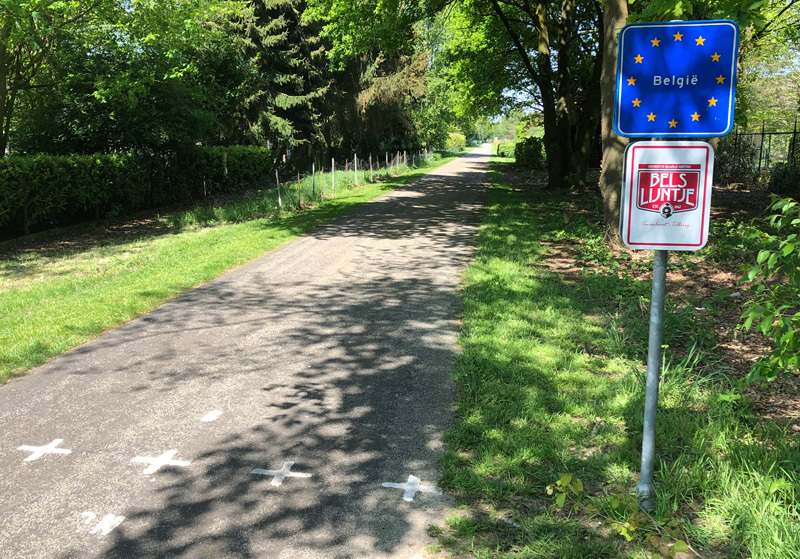 The cycle route crosses the border 8 times before we even get to the “real” international border between Belgium and the Netherlands, a few kilometres south of Baarle. 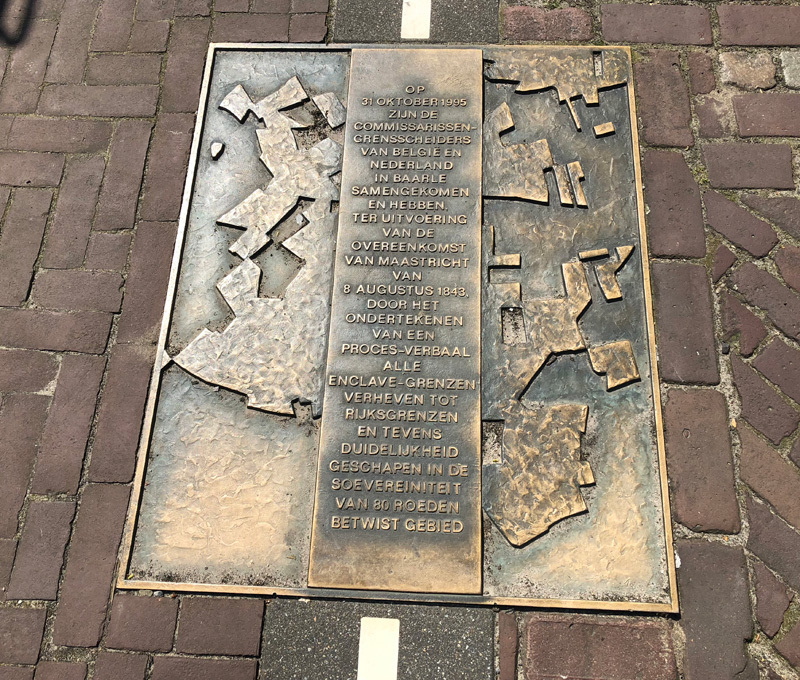 A commemorative plaque (right at the border) of the treaty to establish the borders between the Netherlands and Belgium of 8 August 1843 and the signing of the addendum to finalise the borders in Baarle on 31 October 1995. There are other indications that you cross the international border from Belgium to the Netherlands. The blanket speed limit inside the built-up area in Belgium and thus in Baarle-Hertog is 50km/h and in the Dutch part Baarle-Nassau it is 30km/h. So the speed must come down when you cross the state border, even though the street is exactly the same. (See the signs to the left). Nothing changes on the cycleway though. 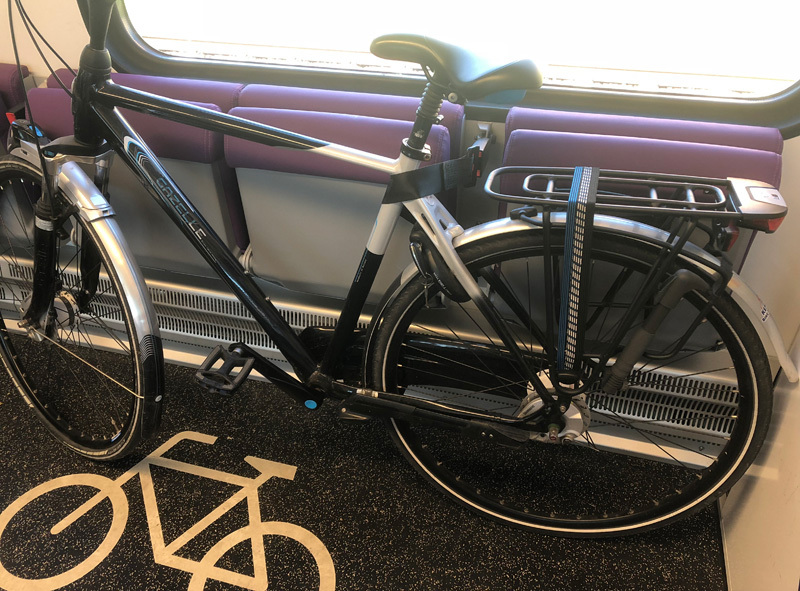 I wish I could have cycled all the way to Turnhout, but I had to be back in Tilburg before the time you are allowed take a bike in the train ended for the rush hour. 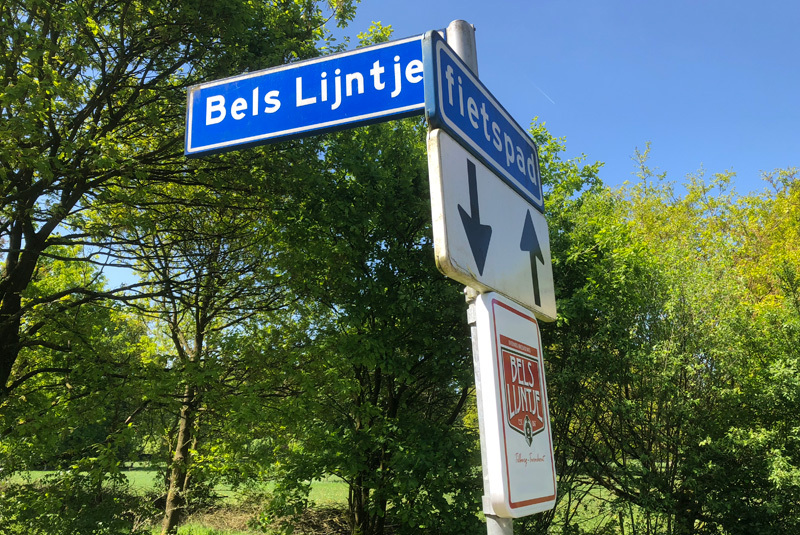 However, I found the route on the Bels Lijntje so attractive that I am certainly going back one day to cycle the entire 33 kilometres (and back again). 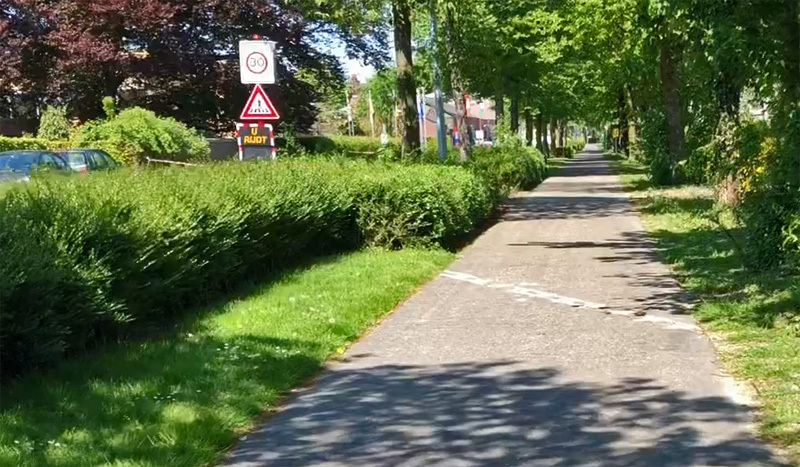 My video about the cycleway on the “Bels Lijntje”. A ride from Tilburg to just across the Belgian border on the “Bels Lijntje”. The route on Google Maps. A British lady also went to Baarle-Nassau and Baarle-Hertog and she made a nice short video with an explanation of the border town phenomenon. “The lady travels” in her video about Baarle-Nassau and Baarle-Hertog. We have the Silver Comet Trail in Georgia (US). Built on a former railway, it runs from Atlanta on into Alabama. It get lots on cycling traffic as evidenced by this Strava Heatmap. A while back I had the pleasure of cycling on Boston’s Minuteman Bikeway. It was also built on a former rail line discontinued in 1981. It opened in 1991. 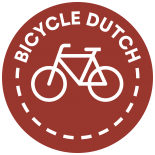 This entry was posted on 5 June 2018 by Bicycle Dutch in Original posts and tagged Baarle-Hertog, Baarle-Nassau, Belgium, long distance cycle paths, railwaystations, ride, Tilburg.